EMPLOYER Difference of EE share and Pension Contribution 8.33% ## 0.5% ## 0.50% !! @@ In case Establishment is exempted under PF Scheme, Inspection charges @0.18%, minimum Rs 5/- is payable in place of Admin charges. In case the Establishment is exempted under EDLI Scheme, Inspection charges @ 0.005%, minimum Re 1/- is payable in place of Admin charges. > The employee can pay at a higher rate and in such case employer is not under any obligation to pay at such higher rate. > To pay contribution on higher wages, a joint request from Employee and employer is required [Para 26(6) of EPF Scheme]. In such case employer has to pay administrative charges on the higher wages (wages above 15000/-). > For an International Worker, wage ceiling of 15000/- is not applicable. > Contribution is payable out of the employer’s share of PF and no contribution is payable by employee. When an employee crosses 58 years of age and is in service (EPS membership ceases on completion of 58 years). When an EPS pensioner is drawing Reduced Pension and re-joins as an employee. In both the cases the Pension Contribution @8.33% is to be added to the Employer Share of PF. (Pension contribution is not to be diverted and total employer share goes to the PF). In case an employee, who is not existing EPF/EP member joins on or after 01-09-2014 with wages above Rs 15000/- In these cases the pension contribution part will be added to employee share, EPF. > In all other cases Pension Contribution is payable. A member joining after 50 years age, if not a pensioner does not have choice of not getting the Pension Contribution on grounds that he will not complete 10 years of eligible service. The social security cover is applicable till he/she is a member. > For International Worker, higher wage ceiling of 15000/- is not applicable from 11-09-2010. As on 31st March 1972, the enhanced rate of 8 per cent ‘was applicable to the establishments employing 50 or more persons. Total basic wages, dearness allowance (including the cash value of any food concession) and retaining allowance (if any) payable to each employee who is a subscriber. As on 31st March 1991, the enhanced rate of 10 per cent ‘was applicable to the establishments employing 50 or more persons. 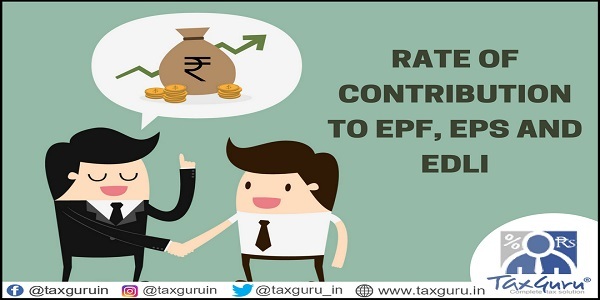 to 21.09.1997 8.33%, Enhanced rate 10% Notification dated 9th April, 1997 was issued enhancing Provident Fund contribution rate from 8.33% to 10%. With this 172 categories of industries/establishments out of 177 categories notified were to pay Provident Fund contribution @ 10% w.e.f. 1.5.1997. 01.11.1952 to 31.12.1962 3% Total employers’ and employees’ contributions. 01.01.1963 to 30.09.1964 3% Total employer’s and employees’ contributions payable @ 6.25%. 2.4% Total employer’s and employees’ contributions payable @ 8%. 01.10.1964 to 30.11.1978 0.37% On total pay on which contributions are payable. 01.12.1978 to 30.09.1986 0.37% On total pay on which contributions are payable. Minimum Administrative charges payable per month per establishment was Rs. 5/-. 01.10.1986 to 31.07.1998 0.65% On total pay on which contributions are payable. Minimum Administrative charges payable per month per establishment was Rs. 5/-. 01.08.1998 to 31-12-2014 1.10% On total pay on which contributions are payable. Minimum Administrative charges payable per month per establishment is Rs. 5/-. 01.01.2015 to 31.03.2017 0.85% On total pay on which contributions are payable. Minimum Administrative charges payable per month per establishment is Rs. 500/-. 01.04.2017 to 31.05.2018 0.65% On total pay on which contributions are payable. Minimum Administrative charges payable per month per establishment is Rs. 500/-. 01.06.2018 onwards 0.50% On total pay on which contributions are payable. Minimum Administrative charges payable per month per establishment is Rs. 500/-. 01.11.1952 to 31.12.1962 0.75% On total employees’ and employer’s contributions payable @ 6.25%. 01.01.1963 to 30.09.1964 0.75% On total employees’ and employer’s contributions payable @ 6.25%. 0.60% On total employees’ and employer’s contributions payable @ 8%. 01.10.1964 to 31.07.98 0.09% On total pay on which contributions are payable. 01.08.1998 onwards 0.18% On total pay on which contributions are payable.